The anti-slip material is in the colors white, yellow and blue to obtain. We can deliver with or without climbing slats. The antislip is a soft PVC material with high abrasion resistance. Super grip for the dogs, even in wet weather and light frost! Width Price per meter length. 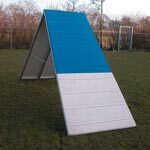 This maintenance free A-frame can be deliverd in the standard colours white/bleu. The frame of the A-frame is all of aluminium. The surface is made of plastic with a super non skid surface. The slats are minimum of height. Place the two side's on the ground whit the small sides to each other. Take the pins and fix the two parts together. Pull up with two people and place the chains.